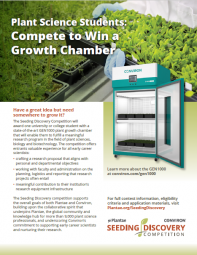 The Plantae Conviron Seeding Discovery competition aims to equip a successful university or college student with a state-of-the-art plant growth chamber that will enable them to fulfill a meaningful research program in the field of plant sciences, biology, and biotechnology. The Seeding Discovery competition application period begins April 8, 2019 and runs through midnight EDT on June 7. It is expected the winner will be announced in late July. NOTE: See GEN1000-SH specifications at conviron.com/gen1000 . Chamber will be supplied without optional accessories. 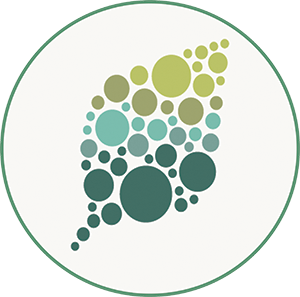 The Seeding Discovery competition supports the overall goals of both Plantae and Conviron, building upon the collaborative spirit that underpins Plantae, the global community and knowledge hub for more than 9,000 plant science professionals, and underscoring Conviron’s commitment to supporting early career scientists and nurturing their research. Conviron recognizes that today’s students are tomorrow’s research leaders. 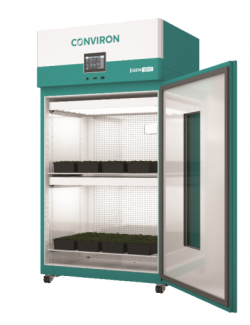 By supporting the next generation of researchers, Conviron aims to achieve its vision of contributing to feeding the world, improving human health and protecting the environment by providing technology that advances plant science and production.